Why Blue? 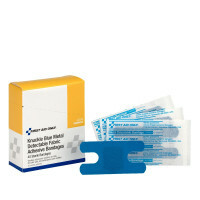 Blue Visible Bandages and Metal Detectable Bandages in Finger Tip, Knuckle, and standard Bandage sizes for recognition and to avoid process contamination. 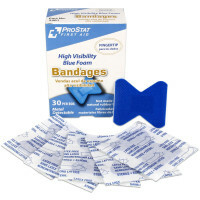 Available in Foam Bandage, Woven Bandage, and Plastic Bandage options. 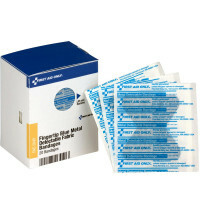 Blue Metal Detectable Bandages offer double protection from loss in Restaurants, food service, and other processes where contamination may be an issue - our Metal Detectable Blue Band-Aids come in foam or woven varieties and Finger Tip Bandage, Knuckle Bandage, or 1" x 3" sizes. 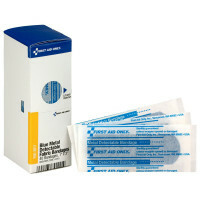 Blue Visible Bandages: Our blue adhesive bandages are easily visible in case of loss, although they tend to stay put even when wet. 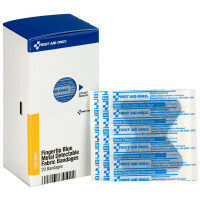 Used often in food packaging and restaurant work, but popular for many other uses where it is critical to see a bandage should it come free in the process of work or handling. 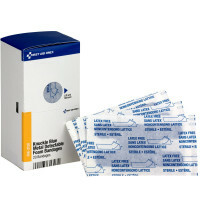 SmartTab EzRefill Bandages in packs of 10-100+ in Knuckle, Finger Tip, and Visible Blue Adhesive Strip Bandages. 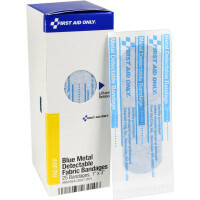 Blue Foam Bandages: Our blue foam adhesive bandages have all the advantages of high visibility and metal detection, PLUS the added benefits of not adhering to the wound as a normal fabric or plastic bandage may - making them easier to apply and remove. 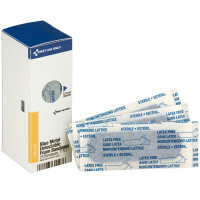 These foam bandages also serve as a cushion to protect the affected area. 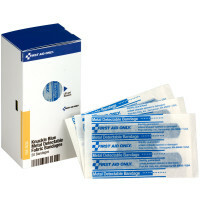 Most important of all - foam wound dressings can be used on infected wounds! 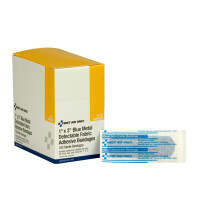 For Food service and other uses where you can't afford to lose one! 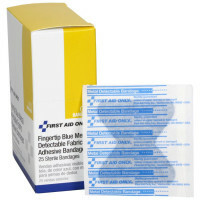 Woven & Foam, in Standard as well as Fingertip and Knuckle. Popular for restaurant kitchens, food processing and pharmaceutical applications.. even some technical applications-Detect contamination! 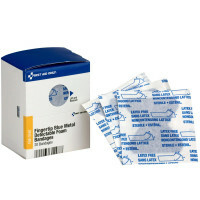 These special bandages are used by food handlers. 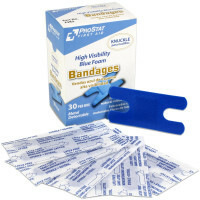 These are waterproof or water resistant, have strong adhesive so they are less likely to fall off, and are bright blue in color so that it is obvious to the wearer if it has fallen off into some food. There are also blue metal detectable by special machines that are used in food manufacturing plants to ensure that food is free from foreign objects before it is shipped to the public.